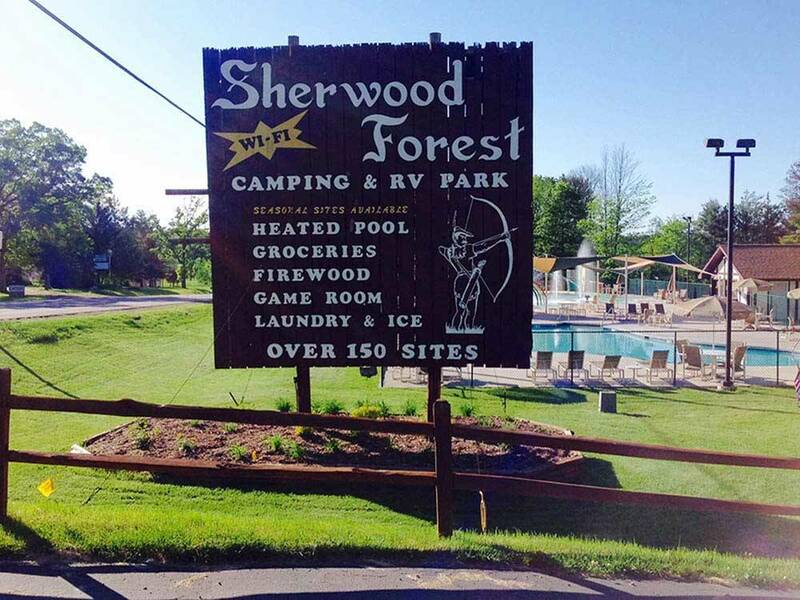 Quiet family camping within walking distance to downtown Dells. Easy on/off Interstate access. Huge heated pool and splash pad, themed weekends, planned activities and events. Cabin rentals and Big Rig friendly! Nice place/people with a Robin Hood theme. We camped on top of the hill, level grassy site with water/elec only #52. Fall season so it was pretty empty until the weekend Fall festival. Totally booked year ahead. Walking distance to amusement parks, tourist trappings and boat rides. Restroom/Shower ok but lots of bugs and push button water. I imagine summers have lots of families with lots of kids. Good facility and well staffed. Family oriented with lots to do for kids. Staff were courteous and helpful. Enclosed dog park available. Laundry facilities were excellent. Would stay here again but request a site away from the office which has a lot of foot traffic. Security guard on duty during after hours. We stayed Thur-Sun early June. Prices are comparable to other private campgrounds with W/E/S. Perfect location right off the main fairway. Ask for site towards back to avoid road noise. Entrance is rather sudden and right as lanes go from 2 to 1. I only mention this in case you are towing a big rig with cars behind you. Staff were friendly. Sites are very narrow but we checked out other campgrounds in the area and this was by far one of the best. Lots of pull thrus (which we had) Being a tourist area all the campgrounds are trying to cram what they can into a given space. Restrooms and showers were clean. As expected, they are centrally located for tent campers. Shower requires two hands as water stays on less than 10 secs at a time. We stayed on site 140 which by far was the largest but it faces the side of a warehouse building up a steep hill. I didn't like that at first but in the end it was very quiet and private and much roomier compared to all the other sites. Sites are pretty level for the most part. Walking distance from Pirate's Cove Golf and Entertainment. Garbage is centrally located. WiFi was fine on Thurs but pretty non-existent rest of the weekend. We have stayed here several summers consecutively and love it! Office staff, workers on the grounds are all more than friendly! Prices are very reasonable, making reservations 1year out are all reasons we are planning on returning again next year! We were unable to check in on time this year due to car trouble-after a phone call to the camp office-our site information was posted outdoors for us and we were able to set up after midnight! Would not think of staying anywhere else-even after 10 years!